In the August 11th, 2006 edition of Science magazine, a team of scientists led by John D. Miller published their findings of a study designed to investigate Americans’ rejection of the theory of evolution. According to a recent study, only fourteen percent of Americans, or a third of all United States citizens, believes the theory of evolution to be definitely true, and more than fifty-five percent hold tentative views of evolution. In the global community we rank second to last in acceptance of evolution, right above Turkey, but below such technologically advanced nations as Cyprus, which I thought was a flower of some sort, and Latvia, which up until now I assumed was a fictional country in the Marvel Universe ruled by the Machiavellian Doctor Doom. Now, why would a group of people reject a fundamental scientific theory in favor of a book that they barely understand? That’s right, I think we’re just too damn lazy to actually begin at Origin of the Species and work forward through scientific literature to understand evolution, and instead prefer the biblical account of creation over the scientific one simply because it’s easier to understand. Biological divergences…natural selection…common ancestry…damn, that’s just complicated stuff! Not to mention boring! The Bible’s version is just so much more exciting and science-fictiony, but never you mind the fact that it was never meant to be taken literally. Or that the creation narratives in Genesis were created by two different tribes of early Jews, and were later crammed together in a totally hack editing job. You might be surprised, but I fully support this willful intellectual ignorance. In fact, I’m planning on disbelieving in everything that I don’t want to waste time learning, and later blaming it on my religion. Theory of gravitation? How silly…we all know that the Flying Spaghetti Monster keeps us stuck to the ground with marinara sauce. Plate tectonics? That’s just stupid. When God spoke to the Famenites, he told them the ground was made of delicious nougat. Heliocentrism? BLASPHEMY! The internal combustion engine? Don’t be retarded. We all know that prayers power our SUVs. As of right now, I only believe in three things: 1. Nutella and graham crackers; 2.Cold milk; 3. Napkins. Okay, maybe I shouldn’t have finished writing this right before my snacky time, but you get the idea. GAWWW, this makes me wanna yak. Not your post, which is fab, but the poll results. And then the Lord of Kobol came, and Starbuck flies again, and I want snacks too. Just like those religious fascist morans! And you have already heard my theory on Sodom and Gomorrah. But you guys view religion much more pragmatically across the pond. I think it stems from the fact that you actually have historical instances from which to draw upon that illustrate exactly why fundamentalist views on religion are a bad, bad idea in running government. Religious wars are in your collective history, but not in ours. Us Yanks simply don’t have that. Our country was founded upon both puritanical and deistic roots, and right now, for some reason, we’re falling back on the puritanical side to inform policy. It’s not a good idea, and history shows us that, but unfortunately we’re not very good at history. 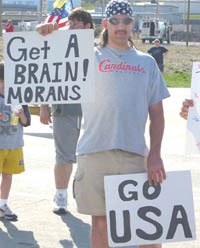 That guy is really protesting Representative Jim Moran of Virginia and has repeatedly claimed the Moran has a split personality. So give him a break.